Twenty eight florins a month is a huge price to pay, for a man to stand between you and the Wild.Twenty eight florins a month is nowhere near enough when a wyvern's jaws snap shut on your helmet in the hot stink of battle, and the beast starts to rip the head from your shoulders. 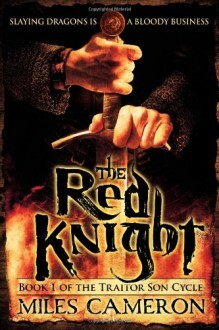 But if standing and fighting is hard, leading a company of men - or worse, a company of mercenaries - against the smart, deadly creatures of the Wild is even harder.It takes all the advantages of birth, training, and the luck of the devil to do it.The Red Knight has all three, he has youth on his side, and he's determined to turn a profit. So when he hires his company out to protect an Abbess and her nunnery, it's just another job. The abby is rich, the nuns are pretty and the monster preying on them is nothing he can't deal with.Only it's not just a job. It's going to be a war. . . Through most of it didn't care enough, by the end I was quite interested in what was going to happen to some of the characters.